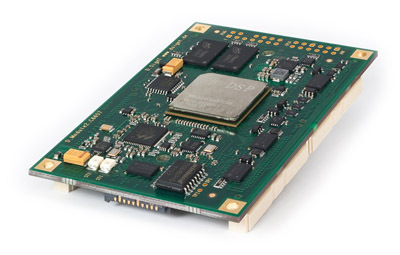 The D.Module2.C6557 is a TMS320C6657 DSP module offering a versatile embedded DSP single board solution for developers - requiring a more powerful integrated floating point processor capability as well as extensive communications and I/O capabilities. It is available in commercial and extended temperature configurations. Primarily intended for OEM developers looking to reduce time to market while lowering total cost, It can be used as a stand-alone system, or as a mezzanine daughtercard embedded within a larger system or board design. The D.Module2.C6657 incorporates a powerful dual-core floating point TMS320C6657 Keystone DSP Processor, capable of performing up to 40GMACs / 20GFLOPs per core, combined with 512MBytes of DDR3 RAM, FLASH ROM, and a host of communication and I/O interfaces: I2C; USB; a UART with RS232 and RS422 line drivers; 1000Base-T Ethernet with on-board magnetics or external fiber transceivers; PCIe and a SRIO link operating up to 5 GBaud, and 16 bit-programmable I/O ports. High-speed data converters can be directly interfaced to the parallel peripheral interface, which supports data rates up to 120M bytes/sec. For higher speed devices, an FPGA board can be inserted in the signal processing chain to provide data buffering and pre-processing. The FPGA can be cost-efficiently interfaced via the parallel peripheral interface or - for the most demanding applications - via SRIO (serial Rapid-I/O). The D.Module2.C6657 operates from a single 3.3V supply. The parallel interface, I2C, SPI, McASP, and GPIO ports are 3.3V LVTTL compatible to facilitate system integration. The 8MByte of non-volatile Flash Memory stores program code, data sets, and configuration settings. The Flash can be conveniently (re-)programmed in-field via the resident D.Module2.BIOS functions. A base board D.Module2.Base is available for prototyping and evaluation. The modular, self-stacking concept facilitates building complete signal processing systems and allows for the addition of FPGA boards into the signal processing chain, between the data acquisition front end and the DSP. All on-board peripherals are comfortably initialized and programmed via D.Module2.BIOS functions. In situations where additional functionality is required, developers can extend the capabilities of the D.Module2.C6657, using optionally available data acquisition and I/O modules, or with their own application-specific hardware.